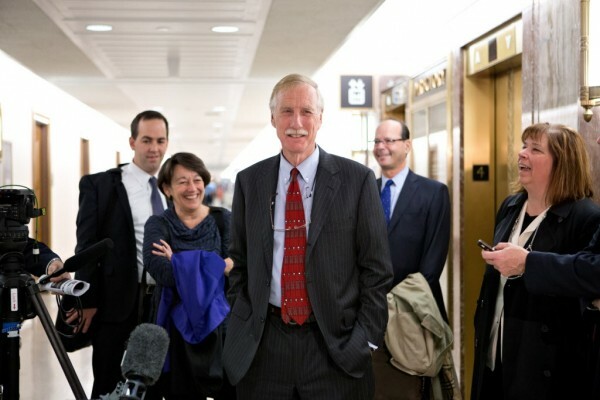 Senator-elect Angus King, I-Maine (center), the former governor of Maine, arrives on Capitol Hill in Washington on Tuesday, Nov. 13, 2012, to meet with Republican Sen. Susan Collins, R-Maine to discuss committee assignments and how they'll work together to represent Maine in the Senate. Angus King will become the 55th member of the U.S. Senate’s Democratic caucus when he is sworn into his new job in January, Maine’s senator-elect said Wednesday at a news conference in the U.S. Capitol. The decision — while largely expected — puts an end to months of speculation about which party King, an independent former governor, would team up with when he arrived in Washington, D.C. The decision also helps Democrats add to their newly expanded Senate majority following last week’s elections. King said joining the Democratic caucus will still allow him to stake out independent positions. It also positions him well to be an effective senator, he said, since the Democrats are the Senate’s majority party. Although King was the front-runner from the time he joined the race to replace Olympia Snowe, who is retiring from the Senate, he previously had refused to say whether he would caucus with Senate Democrats or Republicans, or any party at all. He said Wednesday it became clear he would have to caucus with one side or the other to secure assignments on committees, which is where the Senate does the bulk of its work. The Senate currently has two independent members, Bernie Sanders of Vermont and Joseph Lieberman of Connecticut, and both caucus with the chamber’s Democrats. With Lieberman leaving the Senate at the end of the year, King and Sanders will be the only independents in the chamber. In his prepared remarks, King said he consulted closely with Sanders and Lieberman about their experience as independent members before choosing to caucus with Senate Democrats. “Both confirmed that the Democratic caucus generally and its leadership in particular had consistently allowed them to maintain their independent positions and had never forced positions upon them in the name of party loyalty,” King said. He also spoke with Senate Majority Leader Harry Reid of Nevada and a former Senate majority leader, George Mitchell of Maine, before making his caucus pick. “I came away from these conversations reassured that my independence would be respected, and no party line commitment would be required or expected,” he said. Reid joined King at his news conference to welcome Maine’s incoming junior senator to the Democratic caucus. King and Reid discussed committee assignments for Maine’s new senator as part of multiple conversations about his joining the Democrats, said King spokeswoman Crystal Canney. “The committee assignments are still being worked through, and he feels very positive about them,” Canney said. King planned to cast a vote for Reid as Senate majority leader in Wednesday’s leadership elections. King also discussed committee assignments with Maine’s soon-to-be senior senator, Republican Susan Collins, when the two met in Collins’ Washington, D.C., office Tuesday. Collins said in a statement that she was disappointed, but not surprised, by King’s decision to go with the Democrats. Before settling on the Democratic caucus, King said he spoke with more than a dozen senators from both parties. Those conversations included one with Sen. Roy Blunt, R-Mo., vice chairman of the Senate Republican Conference. King never spoke with the Senate Republican leader, Mitch McConnell of Kentucky, Canney said. Representatives for Blunt and McConnell didn’t immediately respond to requests for comment.